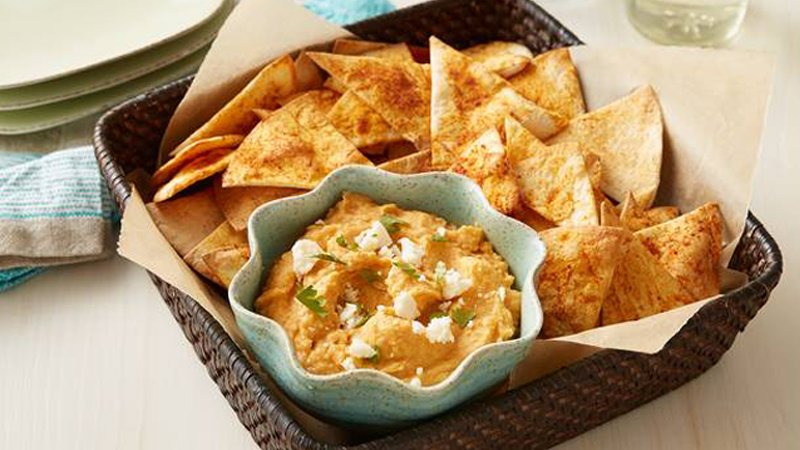 A quick and easy veggie chick pea dip made extra-special served with homemade tortilla chips. 1. Preheat the oven to 200°C (180°C for fan assisted ovens), gas mark 6. Lightly grease a large baking sheet. 2. Brush both sides of all the tortillas lightly with the water then sprinkle half the taco seasoning over both sides. Cut each tortilla into 6 wedges and place on the baking sheet. Bake for 8-9 minutes, turning once, or until light golden brown. Transfer to a wire rack and leave to cool completely. 3. Meanwhile, to make the hummus place the drained chick peas in a blender or food processor with the lemon juice, oil, garlic and remaining taco seasoning mix. Blend or process to a course paste, then add 4-6 tablespoons of the reserved chickpea liquid and process again until you have the desired consistency. 4. Transfer the hummus to a serving bowl and garnish with the coriander and crumbled feta cheese, if liked. Serve with the tortilla chips. • Store the tortilla chips in an airtight container for 1-2 days. The dip will keep, covered in the refrigerator for 2-3 days. • For a hot and spicy hummus, add 1 tablespoon drained and finely chopped Old El Paso™ Sliced Red Jalapeños to the blender or food processor.